A second opinion is indeed a good idea if you have doubt on the proposed treatment or you think your doctor underestimates the seriousness of your illness. You can also ask for second opinion even if you trust your primary care doctor and his treatment, just to get information about every available treatment options. • First of all, tell your doctor that you want to ask for a second opinion. Tell him that you trust his treatment plan, but only want to ensure that you have thorough information about available treatment options. • Collect the copies of your medical records, lab and test reports so that you can show it to your second opinion doctor. • Your primary care doctor can be the best person to recommend a doctor for your second opinion. So try to seek help from him. • Some medical care center has referral services for available physicians by phone or online. • Always try to look for the specialist who is experienced in treating your disease. • If possible, based on insurance and how quickly you need treatment, schedule appointments to interview several doctors to get the best and most informed outcome. 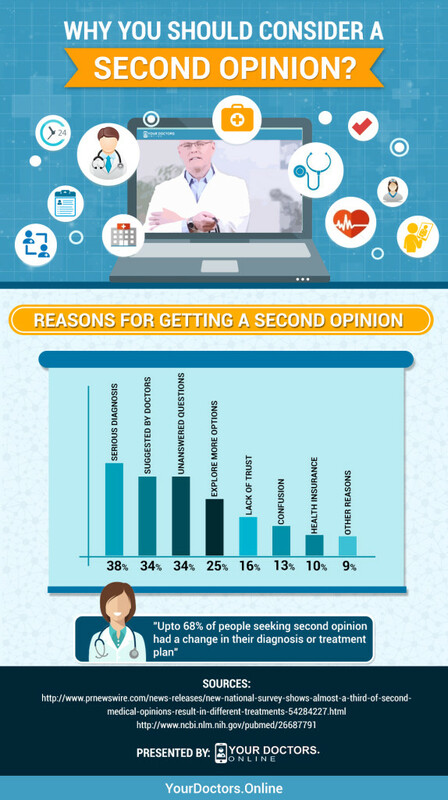 Generally 68% of patients had a change in their diagnosis or medical treatment after obtaining a second opinion online.